Last minute availability this weekend, 14th, 15th Sept. Hire the barn, sleeping 12, for £108 a night and get another night free. Come and see the Autum colours at Gateham Grange Farm in the Peak District and enjoy some Autum walks at Alstonefield Camping Barn. 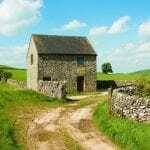 The camping barn provides camping under cover in a remote cosy Peak District barn with unrivalled views. Close to the unusual limestone landscape of the Manifold Valley and Staffordshire Moorlands. Away from roads and Wifi the Barn makes a great family escape.